As shown on the www.enplus-pellets.it website, ENplus certification, based on the standard ISO 17225-2, aims to make the new European standard operational, ensuring that the pellet produced and marketed meets the requirements indicated. ENplus allows the end consumer to buy pellets with high quality and constant properties throughout Europe, guaranteed by a transparent certification system. This is not just a product certification, but a system that examines the entire production chain, from the production/receipt of the raw material, to the fuel’s storage, up to the delivery of the pellets to the end consumer. Class B, featuring a maximum ash content of 3%. The raw material used can be both sawdust and bark. It is intended for large installations for commercial and/or industrial use. Brunnen Industrie s.r.l. 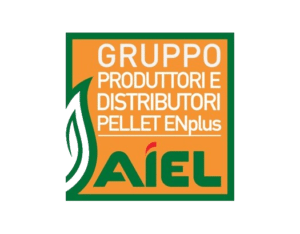 is a company created with the aim of qualifying the sector in which it operates, distributing and promoting within its sector, quality pellets and logs coming from production plants that have implemented the ENplus ISO 17225-2 certification system in their production process. The experience gained over the years by its members has ensured that within it there is naturally a particular sensitivity to guaranteeing the end consumer a product coming from a “certified supply chain”. In the Brendola bagging plant, in the province of Vicenza, Brunnen Industrie s.r.l. only packs pellets coming from plants that are constantly monitored and visited by their managers and that are able to provide a steady high quality that can be proven in all production processes, from sourcing the raw material to packaging in big bags, up to delivering the goods. Compliance with the requirements of the standard and its implementation within the company is for Brunnen Industrie s.r.l. a milestone in the way of operating and treating its customers and the pellet market, both nationally and internationally.